campaign is back for another year and bolder than ever. winning a one-of-a-kind artwork personalised to their opinion. crab” or tastes “smokier than Darth Vader’s funeral pyre”, get sipping! varying levels of smoky intensity rarely failing to illicit a powerful reaction. calligraphers to turn a selection of the best opinions each week into a unique piece of artwork that will be sent to the winners. world, as well as being supported by on-trade tastings. 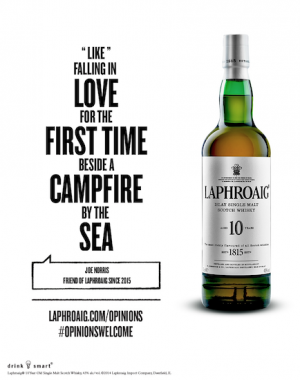 www.laphroaig.com/opinions to find out more. the thick blue smoke from old peat-fired kilns. garnered a loyal and passionate following of whisky enthusiasts and continues to divide opinions around the world.